Created in 1991 by Solara in Colorado, USA. The Starry Processional is the first of the 11:11 Sacred Dances. It brings together our One Being by aligning us into One Star, then we spiral into the Ultra Greater Reality. 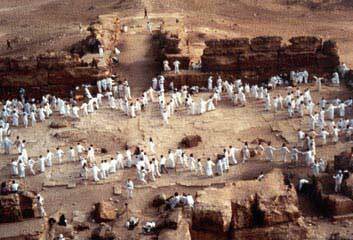 This dance was performed worldwide by over 144,000 people at the 11:11 Activation on January 11, 1992. It is the only 11:11 Sacred Dance which has been danced at every one of our Master Cylinders at the 11:11 Gate Activations. The Starry Processional is our first 11:11 Sacred Dance and has been performed throughout the world. It was an important part of the original 11:11 Activation on January 11, 1992. This dance was created in June 1991 by Solara. The dance symbolizes the realignment of the Star of our Oneness. Whether you actively participate in it or watch it from afar, its effects are most powerful. Whenever we perform any of our Sacred Dances we wear white clothing to symbolize our inherent Oneness. Recently, we have also added very bright colors in addition to our whites to symbolize the new, vibrant frequency band of energy we are entering. The Starry Processional is extremely transformational. Please remember to hold the sanctity of the Star as you slowly revolve throughout the dance. You might want to keep your eyes partially closed. And no-one, not even the faciltator of the dance, should talk during it! Whenever we perform these 11:11 Sacred Dances in groups large or small, anywhere on this planet, remember that everyone is dancing with you, for truly we are woven together in Oneness. Even if you are a tiny group of inexperienced dancers, when you perform these Sacred Dances with sincerity and an open heart, you will feel all of us dancing with you as One Being! First, we form a circle with everyone facing the center and holding hands. Remember, that for all our dances, our right hands face downwards and our left hands face upwards. Now, we need to determine how many people are going to form a ray of the star. This will depend on the number of people in your group as well as the size of the space you are in. If you have a small group, then every other person will be an outside point and the people in between them will become inside points. If you have a large group, you may want 2 – 4 people in the middle of the points, forming very large rays. The leader of the dance should go around the circle and designate the inner and outer points who will either step forward or backward into position. Now, your circle should resemble a star. The points of the rays are key positions for anchoring the energies and keeping the individual rays in alignment with the whole star. It’s very important that the inner and outer points of the rays keep their position strong throughout the dance or else the star will become very messy. The points also need to be aware throughout the dance of the overall shape of the star, watching that some rays don’t become squished together while others are too stretched out. They may need to continually adjust their position to keep the star balanced. 1. Raise your right knee upwards and to the left. 2. P A U S E.
3. Place your right foot on the ground to the left of your left foot. 4. P A U S E.
5. Move your left foot so that it is to the left of your right foot. 6. P A U S E.
Repeat this step over and over throughout the dance. The important thing is to keep observing the Pauses you make between each movement. The Pause should last as long as the preceding movement. And the pauses are just as important as the movements. Often, people are in such a hurry to make the steps, that they forget the heightened PAUSES and this makes the dance go too fast. This can ruin the whole tempo of the dance which is a stylistic, sacred movement. THE MUSIC FOR THE STARRY PROCESSION BEGINS WITH A GONG. Use this time to align yourselves as One Being. Then as the music starts, begin your step. At certain, predetermined places in our dance, we are going to shift the points of the rays. Where and how often this will happen will depend on the size of the star. If you have a small group, then you will want to have a Point Shift each time you return to the place where you started the dance. If you have a large group, you may want to also make a Point Shift when you are opposite the place where you started the dance. To Point Shift, the outer points are going to dance inwards and become inside points, while the inner points will dance outwards and become outer points. You will do this within the regular process of steps with the Pauses in between. It’s important for everyone in the dance to remain aware when it is time to make a Point Shift, then effortlessly move into it. It should be part of the natural flow of the dance, rather than a disruption. As soon as the Point Shift has been made, then the new outer and inner points need to be very conscious to hold the shapes of their ray and of the shape of the entire star. The Point Shifts will take place throughout the duration of the dance. At the end of the dance, you will hear the sound of a gong and the rest of the music will fade away. As soon as this happens, stop dancing and stay in position, anchoring the heightened energies through you.